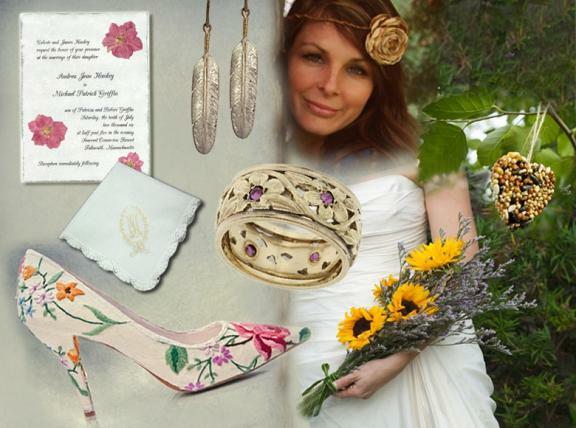 Inspired by Mother Nature, a wildflower themed wedding would create a carefree and sunshine-y feel. And a wildflower wedding offers a great deal of flower options and colors, so there’s no need to limit yourself with a two or three color color palette. Homemade details and vintage pieces would only add to the charm of this laid back wedding theme. For this bouquet, we used sunflowers and purple limonium and then tied it all together with a piece of green velvet ribbon. To get inspired for your own wildflower wedding, check out the full post on OneWed’s Bridal Blog, Savvy Scoop, then head to FiftyFlowers to shop by color, season, or flower type!